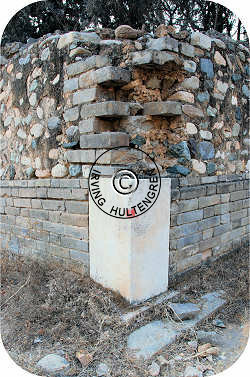 Daoling - Concubine mausoleum #1. This Ming concubine tomb is by far the most serene. If your time is limited, then this is the one to go see. Despite being some 450 years old the greater part of its surrounding wall remains intact. This has fortunately also prevented local farmers from gradually incorporating the tomb precinct into their arable land. Sitting at the northern edge of the small village of Daolingjian just after the last bend in the road when exiting the village eastbound makes the tomb rather easy to locate. The quietness in this somewhat isolated location proves an adequate backdrop when you approach the mausoleum. 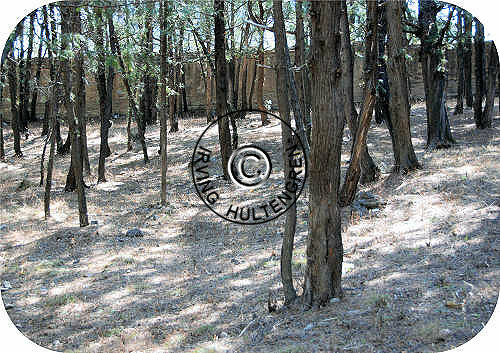 When you cross the entrance (see picture) you enter a rectangular, walled area overgrown with evergreen trees. Only the sound of your feet breaking the twigs on the ground will from now disturb the eerie silence. with the customary large Ming bricks. bricks and rocks on top of a base of bricks. The tomb is orientated southeast-northwest with the entrance at the southern end. Most of the southern wall remains except for the section around the original front gate. Also the front gate itself has long since disappeared. The overall shape is rectangular with the ends being some 85 meters long and the sides double that. The size, layout and contents of the tomb are all very clear indications that the tomb occupant(s) must have been of higher rank. The southern wall was built with the traditional oversized brick -some 20-25 brick high- and with a yellow plaster on the outside. The side walls had a base of 5-10 brick high depending on the elevation and then topped up with differently sized rocks to their full height of some 2.5 meters. The wall has held up remarkably well. The upper decoration of outward curved tiles has collapsed almost everywhere. 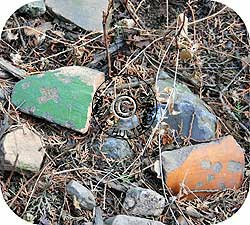 Fragments can still be found around the base of the wall. 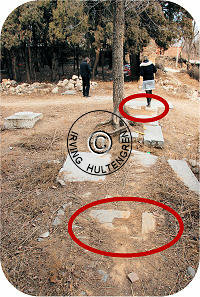 The southeastern corner is missing and the local villagers use the area as a garbage dump just inside the tomb. 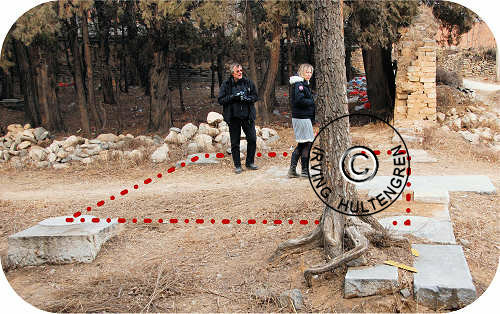 A 4-5 meter section in the middle of the eastern wall is also missing altogether. The villagers has long trodden a path from the southern entrance and across to the opening in the eastern wall. The northeastern corner has been restored with a large rectangular stone block. A narrow opening has been made in the back wall close to the northwestern corner. The entire western wall remains intact except for a small collapse of the upper part of the southwestern corner. The tomb entrance had a front gate on a stone platform with stairs. It is hard to trace the original outline of the entire entrance. 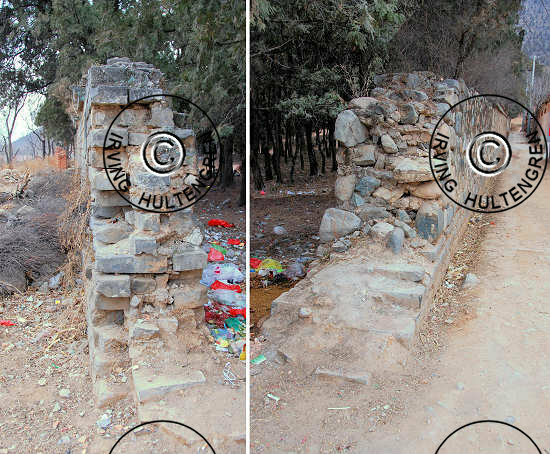 At least four plinths still extant clearly show where the eastern gate stood (see picture). The base stone plate for the door is still in place and clearly visible as is the large stone slab in the center of the door opening. The gate was only one bay wide and one bay deep. The center gate is untraceable and no plinths remain to give away the exact location. There are still some large, broken stone slabs present, but they do not offer a definite outline possibility. The western gate is also missing its column bases but the stone in which the door itself was anchored is still extant and clearly visible. The trodden path leading up to the mausoleum leads to the eastern gate but the original location of the center gate can be deduced by identifying the tomb center line -the Sacred Way. The total front entrance covered the center third of the southern wall. The entire tomb layout is symmetrical in relation to its north-south center line. But the large, white stone or marble slabs paving the Sacred Way found in all imperial tombs are absent. Some 15 meters inside the front gate were two small buildings symmetrically east and west of the center line of the mausoleum. Judging from the remaining pillar bases each building was three bays long and two wide. The structures were probably store houses and a place to change into the proper ceremonial attire when paying homage to the tomb occupants. 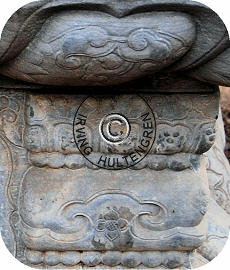 Most of the stone bases are extant but some of them are no longer in their original position. Small parts of the foundation peak through the soil here and there but in general the buildings are discernible because all the collapsed parts -now covered by years of drifting soil- form an elevated platform. The pillars have long since rotted away by many shards of green glazed tiles can still be found scattered around the area. The tiles covered the roof when the building still stood and hence they will logically come to rest at the upper part of the platform. About 30 meters north of the entrance and straddling the center line was a large ceremonial hall, five bays wide and three bays deep. Nothing at all remains of the wooden structure. The large heap of earth mixed with the collapsed building clearly shows the outline of the original building. Many of the stone pillar bases have been moved from their original location but enough of them remain in place to give a good impression of what once was. It's not immediately obvious to the casual observer, but the ceremonial hall actually had an extended platform in front (see blueprint elsewhere on this page). The platform also had a staircase to its south but both platform and the staircase are now buried under centuries of accumulated soil. A precious few stones remain in place to show where the platform is/was. Almost halfway into the mausoleum on the center line are the remains of a square structure, 15x15 meters. 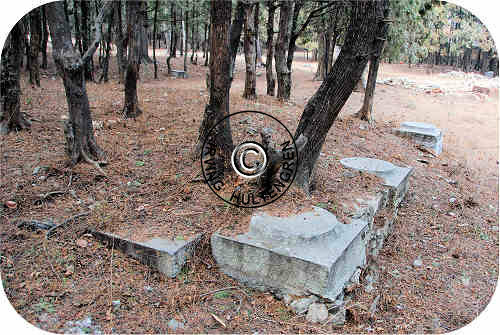 The building itself is long gone but the remains of the wall foundations are still clearly visible. The cypresses are now growing through the walls gradually breaking them down. 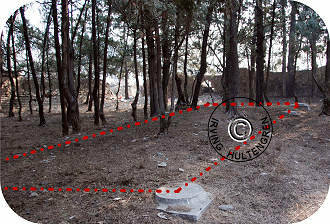 A large stone altar, 2.50m long and 1.25m wide, is placed in an indentation in the ground, close to the rear wall of the original wall structure. The altar has some beautiful decorations albeit not to the same level as those found in the emperors' mausoleums. There are no traces of the traditional ceremonial five stone vessels on top of the altar, but that is hardly surprising given the state of dilapidation and lack of security. The decorations are mostly swirling patterns of what looks like clouds, plants and flowers. Most importantly but unsurprising, there are no images of animals like dragons, phoenixes, mystical beasts or even "normal" animals. Phoenixes are reserved for empresses and may not be used for concubines. Further back on the center line is a small burial mound. It is about 3 meters tall and is overgrown by cypresses. The body of the tomb occupant or occupants was not necessarily buried under the mound itself. 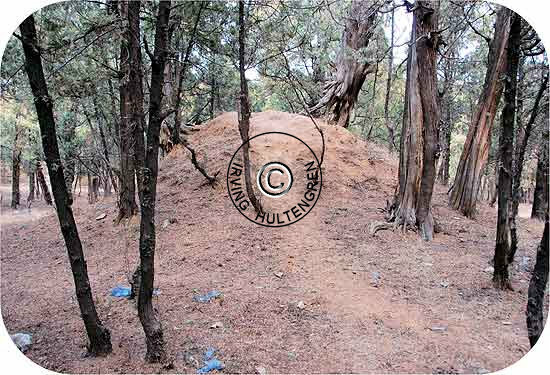 The mound has more of a ceremonial role than that of a protective pile of earth. One cypress growing near the peak is particularly impressive and adds a neat decorative flavor to the mound. A internal semicircular wall stood between the tomb mound and the outer mausoleum walls. The area behind the wall must have been slightly elevated compared to the front part of the mausoleum. 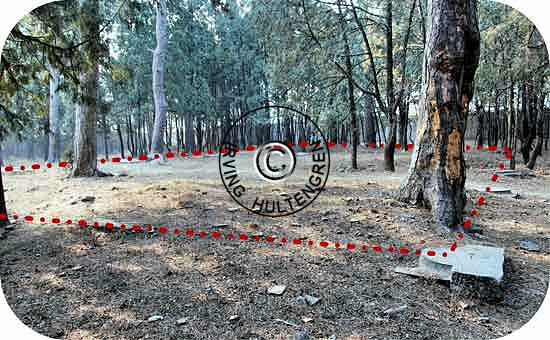 This inner wall can be traced to a point some 11 meters from the eastern and western outer walls respectively. Its northernmost point was likewise some 11 meters from the northern precinct wall. The wall appears to commence in line with the center of the tomb mound. There are visible remains of some structure against the eastern wall where the semicircular wall would have joined up if extended from its end point some 11 meters further in. But similar structural ruins cannot be found at the western wall so it is unclear whether there indeed was a connection. Nowadays only an indistinct, slight elevation reveals the outline of the wall. Walking along the outline uncovers many colored tile shards but very little of the actual wall. A small section is visible where the path leading from the mound to the breach in the back wall crosses. Leaving the mausoleum through the breach in the rear wall places you'll find yourself in front of the large, tree covered hills, which form a beautiful backdrop for the tomb. 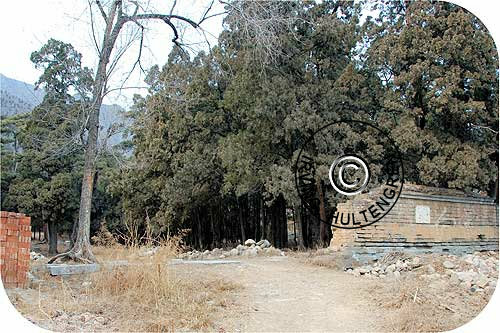 The feng shui value of a mountain to the north of the mausoleum is as valid for a concubine tomb as it is for an imperial mausoleum. The mountain offers shelter for the cold north winds and bad spirits from the north. A small and relatively new irrigation canal runs alongside the back of the tomb a couple of meters from the wall. This canal actually traverses all three Ming concubine tombs in this area. 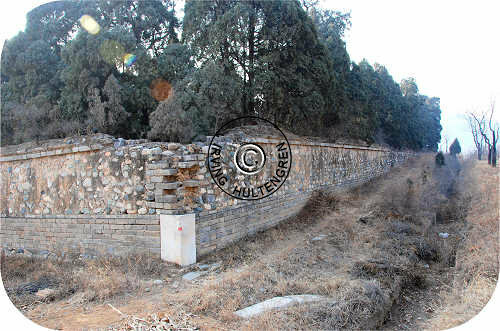 The oversized bricks traditionally used by the Ming dynasty have been used in several locations of the upper part of the rear wall. On several of the brick the original seal of the manufacturer is still clearly discernible. One of the Jiajing Emperor's consorts is interred in this mausoleum, but I do not know who. 18 of his consorts were executed as punishment for their attempt at the emperor's life in October 1542, including his then favorite concubine Consort Duan. After the assassination attempt the Jiajing Emperor moved out of imperial palace and took up permanent residence in Beijing with Lady Shan, a small and thin 13-year old girl. 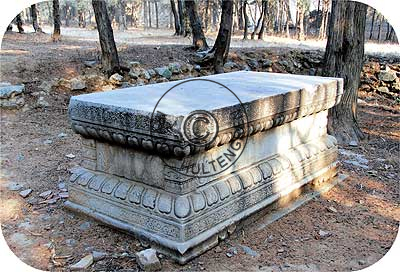 Both Lady Shan and Consort Duan are good candidates for being the occupant of this mausoleum.